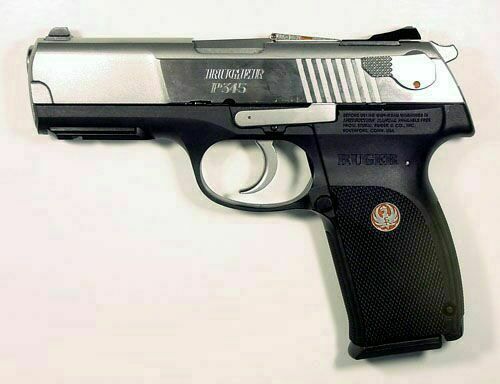 The Ruger P345 was the company's last offering in their P-Series line of pistols, produced from 2005 to 2013. Introduced in 1987, Ruger P-Series pistols were the first firearms produced at Sturm Ruger's Prescott, Arizona plant. The Ruger P345 pistol offers an array of advanced features including a comfortably rounded trigger and guard, redesigned front and rear white-dot sights, loaded chamber indicator and unobtrusive internal lock. It also features a slim, contoured, satin-finished polymer frame with a re contoured checkered grip for improved control and an exclusive Ruger Camblock design to reduce felt recoil. As with all of the P-Series, this is a double-action, recoil operated semi-automatic pistol. This model is obviously intended to appeal to the concealed-carry crowd with its slimmed down profile, smooth edges and rounded contours. Along with its trim look it carries less weight as well. At 29oz it weighs 5oz less than its older sibling, the P90, and 3oz less than its polymer sibling, the P97. Ambidextrous slide mounted decocking lever. Compared to its P-series siblings, the P345 is a noticeably sleeker pistol. The polymer frame and grip have been extensively slimmed down. Add to this the classic P-series .45 cal single-stack magazine and the P345 grip diameter becomes noticeably and comfortably small in the hand, particularly for a .45 caliber pistol. The slimmed down ambidextrous decock levers and slide-lock lever, as well as the trimmed down rear sight further reduce the pistol's profile. The single-stack magazine is fully interchangeable with both the P90 and P97 model magazines. 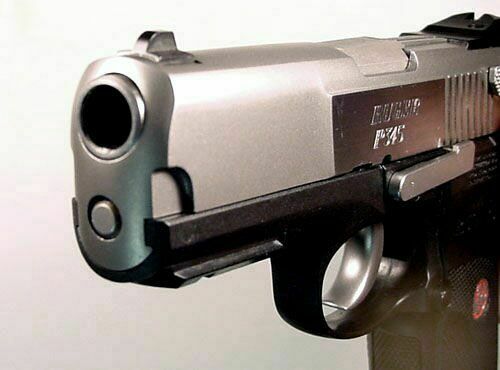 With the introduction of the P97 model in 1999, the plastic magazine follower was replaced with a smaller metal follower. This created space in the magazine for an additional cartridge increasing its capacity from 7 to 8 rounds. 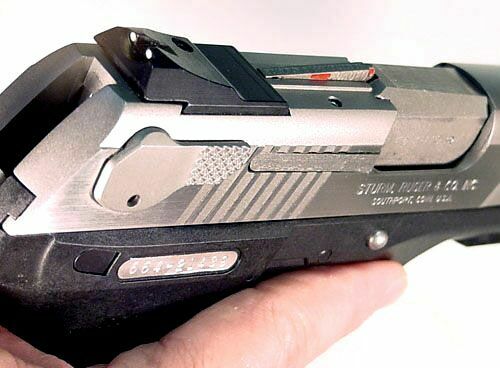 Many polymer frame pistols have embedded metal slide rails, or at least metal inserts embedded in the frame's slide rails to provide additional reinforcement against the slide and barrel recoil forces. 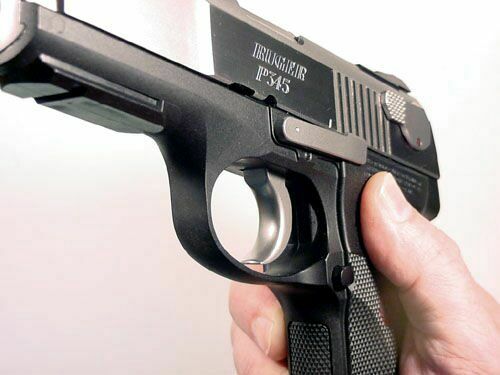 This is not the case for the P345, whose slide rails are simply part of the molded polymer frame. One might think that all-polymer slide rails would not be adequate, particularly for a .45 caliber pistol. But that's not the case for the P345. 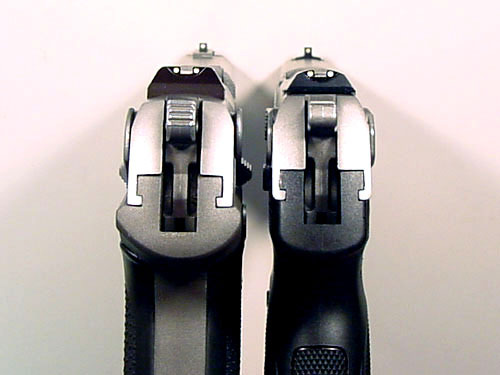 This is because slide and barrel recoil forces are transferred directly to the bulk of the frame through Ruger's unique "camblock" system. In this system the guide rod is fixed to a cam-ramped lug on its rear end, which replaces the traditional "falling block" found in most semi-auto's. The recoiling barrel engages the cam-ramp lug directly, which stops its rearward motion. The cam-ramp lug is attached to the frame via the slide lock lever pin, which absorbs the recoil energy and transfers it directly into the thickest portion of the upper frame, relieving stresses that would otherwise be transferred to the slide rails. A secondary captive spring on the recoil guide rod buffers the slide recoil energy as well. Additionally, the fore-end of the slide that normally just captures the recoil spring, also has an additional set of rails that engage grooves in the "dust cover" portion of the forward polymer frame. This not only provides additional slide rail support, but also forms a tighter dust and dirt barrier between slide and frame. The .45 ACP (Automatic Colt Pistol) pistol cartridge was designed by firearms designer John Browning. Based upon his earlier .380 ACP pistol cartridge, the .45 ACP was introduced along with Colt M1911 pistol adopted by the US Army in 1911. The round was later used in several submachine guns. This is one of the world's most effective combat pistol cartridges, one that combines very good accuracy and stopping power for use against human targets. The cartridge also has relatively low muzzle blast and flash, as well as moderate recoil. Like most pistol cartridges, it is a low-velocity round, and thus not effective against body armour. 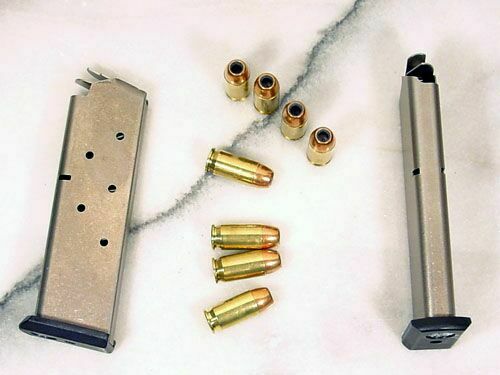 Even in its full metal jacket form the .45 ACP cartridge has a reputation for effectiveness against human targets, because the large bullet has a tendency to expand when it hits bone. Hollow-point configurations increase the expansion and energy-transfer potential of the round. Being a moderate-powered round on the energy scale, .45 ACP bullets have little tendency to over penetrate, which otherwise results when a projectile passes through an intended target with enough velocity to injure another person. The combination of stopping power and controlled penetration makes the .45 ACP practical for police use. Many US hostage rescue teams prefer the .45 ACP because of these qualities. The following data set is based on standard factory loaded cartridges fired from a 5" barrel, listed by weight, brand, type and muzzle velocity. This is only a very small sample of what is available. This gun is extremely fit and trim. There are no perceived rattles when shaken, either empty or loaded. The tall slender slide provides plenty of grip space on its serrations, making it extremely easy to rack. Although the ambidextrous decock levers have been trimmed down, their large flat knurled surfaces still make them easy to engage. The same can't be said for the hammer. With the bobbed hammer spur and stiff hammer spring, it's almost painful to draw the hammer back manually. 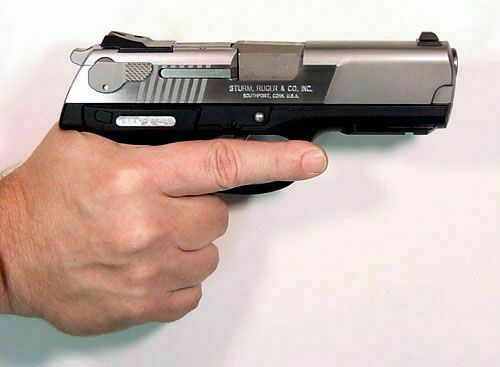 The pistol's double action trigger pull on the other hand is very acceptable. Given the choice then, I would prefer firing the first round from decock via a double action pull, rather than manually cocking the hammer first. The +1 round can be loaded through the open breech. The loaded chamber indicator is beveled on its bottom edge so that it will ride up over the casing head of a cartridge that is already placed in the chamber when the slide is closed. Finally, a word about the magazine disconnect safety. This is a feature that will not allow the pistol fire if a magazine is not inserted. 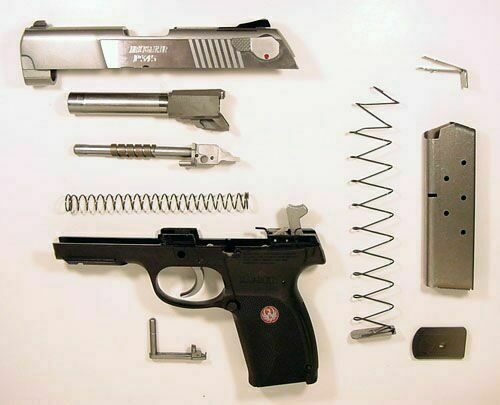 The trigger, hammer and sear still work so that the gun can be dry-fired, but the firing pin is blocked from striking a cartridge that may be in the chamber. Some complain about this feature, as they can't continue to fire while pre-releasing the mag on the last round to engage in a quick reload. Personally, I would probably not be able to keep count in a rapid fire situation anyway, and would rely on the slide locking back to tell me it's time to reload. I otherwise appreciate this feature. It gives me some added safety as I load the +1 round through the breech, before inserting the magazine. Also, its good to know that if I were to somehow loose my gun to my opponent, that dropping the magazine in the process would render the gun useless. I have always loved my old P90. It is one of the most reliable and accurate 45's in my collection. 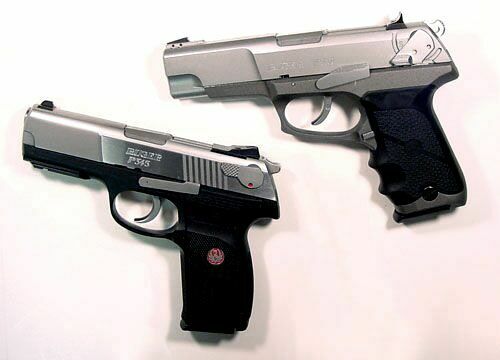 It is the standard I would expect the P345 to meet. And in my opinion, it has. The gun is very comfortable in the hand. Recoil is easy to manage. Double-action trigger pull is reasonable, and single-action pull is light, with a little more than a quarter inch of take-up before a smooth break. And, it is every bit as accurate as my old P90. 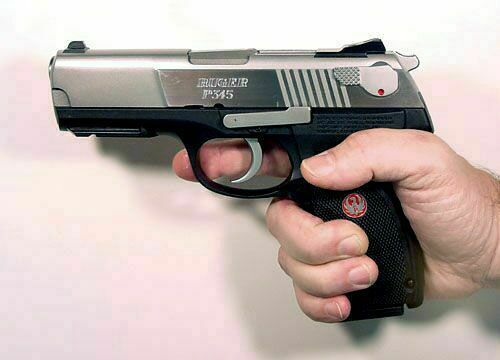 The P345 is the latest offering in Sturm Ruger's P-series line of pistols. The P345 taken down to its field-serviceable components. Note the captive recoil buffer spring wrapped around the recoil spring guide rod, which is part of Ruger's unique "camblock" recoil system. The grip's slimmed down diameter can easily accommodate the smallest hands, while its length still provides full support for larger hands. Smooth contours with trimmed down sights and hammer spur make this pistol a good candidate for concealed carry. The P345's single-stack 8-round magazines shown with a compliment of Georgia Arms 185 grain Jacketed Hollow Points. The P345 is available with, or without the integrated accessory rail. The new checkered grip texture and contours make the grip extremely comfortable. The two red marks on the loaded chamber indicator provide a quick and positive indication of the chamber status. It can also be easily felt in low light conditions. And, just in case you forget what the indicator means, it's stamped with the word "LOADED". The rounded front end of the slide gives the P345 a sporty, futuristic look. Here you can also see the additional slide rail formed into the frame's front end "dust cover". The P345 still carries some of the original lines found in its older sibling, the P90. The P345 is noticeably slimmer than its older sibling, the P90. Also note the shaved-down decock levers, trimmed rear sight, bobbed hammer spur and recessed thumb rests. 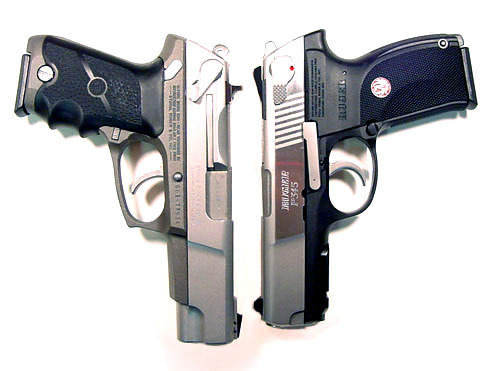 The Ruger P90 and P345 side-by-side. I have had most of the P series over the years including the P90, P97DC and noe the P345. I am most impressed with the 345. Of course there is one thing that I hadto do right away and that was remove the magazine disconnect safety. I really do not mind mag safeties but this one could permanently damage the firing pin so it had to go. As to performance I love this pistol. I am not going to tell how much I paid for this little gem but but it was obscenely low. It loves my standard load of 231 and a 230 grain ball, it has shot all my carry ammo well without a single malfunction in the 5 years I've owned it. It is commander size and weighs 28 ounces empty. I added night sights(they were on sale), and I am eventually going to attempt to convert it to a decock only. I like it so much that if I ever run into another as low priced as this one I am going to have to buy it. My advice, do not be a snob and grab one while you can.